Stick L = 950, W = 18, th = 16.5 mm; ball L = 102.5, W = 96.2, th = 47.3 mm; fibre ties W = 4 mm [RTS 20/9/2004]. Collected by Edward Evan Evans-Pritchard during his last period of fieldwork amongst the Nuer between October and November 1936, where he worked amongst the Nuer Leek in the area west of the Nile [RTS 6/7/2004]. Fishing lure consisting of a light yellowish brown stick (Pantone 722C), cut roughly flat at both ends. The body is essentially straight, but has some irregularities due to the natural shape of the original branch, caused by a series of knots along its length. The surface has been polished. A circular, ring-shaped ball has been fitted over the lower end of the shaft, leaving a short section 55 mm long projecting beyond. This is made of a series of yellow plant fibre cords (Pantone 7506C), each composed of two strands of broad, flat fibre strips. Some of these have been rolled into strands and then twisted to form lengths of cord; the others have been plaited flat in a herringbone style design. Each of the cords has been wound several times around some kind of a core, leaving a hole in the centre; this has produced a soft padded ring with convex sides. The core of this ring is not visible, so it cannot be determined if this is made of the same material. The ring has been held in place on the stick with several lengths of twisted fibre strips, knotted together and then wound around the shaft above and below the ring and tied in place. The object is complete, with a small area of surface missing near the top of the handle, and a few fraying sections of fibre cord. It has a weight of 200.1 grams. The stick is 950 mm long, 18 mm wide and 16.5 mm thick, while the fibre ball is 102.5 mm long, 96.2 mm wide and 47.3 mm thick; the twisted fibre strips used to secure it have a width of 4 mm. Collected by Edward Evan Evans-Pritchard during his last period of fieldwork amongst the Nuer between October and November 1936, where he worked amongst the Nuer Leek in the area west of the Nile. He describes their use of this type of object: 'When fishing in shallows with spears they sometimes strike the water with a ball of twine or the shell of a giant snail attached to a stick ... to attract the fish. Fish are eaten roasted or boiled' (E.E. Evans-Pritchard, 1940, The Nuer, pp 70-72, pls IX-X, and XXIIa-b). He did not record the Nuer name for this type of lure. For a similar object, see 1937.34.46. This object is currently on display in the Upper Gallery, case 28A. Accession Book Entry [p. 38, pencil in left column] 34 [ink] E.E. EVANS-PRITCHARD , M.A., Exeter College. Specimens collected by himself in the EASTERN SUDAN, vis: [addition in different pen] (Coll. in 1936) [p. 42] - From the NUER tribe, A[NGLO]-E[GYPTIAN]. SUDAN, viz: [pencil] 46 [ink] - Similar implement but with ball of plaited cord replacing the shell; same data [“when plunged into the water this makes a noise which attracts fish”]. Additional Accession Book Entry [p. 41] - 1937.34.47. No given AP. Card Catalogue Entry [tribes] - A.E. SUDAN, NUER TRIBE. 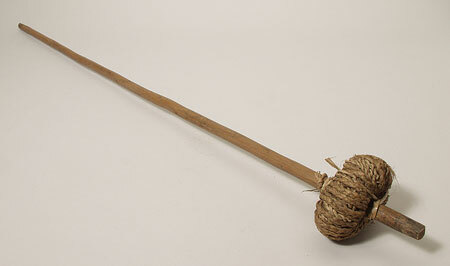 Stick with ball of plaited cord fixed at one end; when plunged into the water this makes a noise which attracts fish. Coll. by donor in 1936. d.d. E.E. Evans-Pritchard, 1937 [RTS 23/7/2004]. Written on object - Noise-making instrument for attracting fish. Plunged into the surface-water. NUER. A.-E. SUDAN. d.d. E. Evans-Pritchard, 1937 [RTS 20/9/2004]. E.E. Evans-Pritchard, 1940, The Nuer, fig. 10 left, pp 71-2. Sparks, Rachael. "Nuer fishing lure" Southern Sudan Project (in development). 03 Jan. 2006. Pitt Rivers Museum. <http://southernsudan.prm.ox.ac.uk/details/1937.34.47/>.